To grow a good crop of onions on the plot with the Chinese way or another - growing on the ridges. To prepare the soil for future planting needs in the fall. For this, the land made: dung humus 5 kg superphosphate 1st. l, nitrophoska 1H. l, Mel 2st. L. In the spring the soil should be well dug, and watered, if it's not wet enough. In each row need to do 2 -3 comb with a spacing of 30 cm and a height of 15 cm two weeks prior to planting sets to warm up near the heater or furnace for 8 hours. This will protect the crop from powdery mildew, strelkovanie and rot. Before planting you need to remove the onion peel, which protects against disease, but being in the ground, releases to the soil substances that slow the growth of follicles. Cut each bulb dry part of the neck and put it in warm water for 24 hours for soaking. 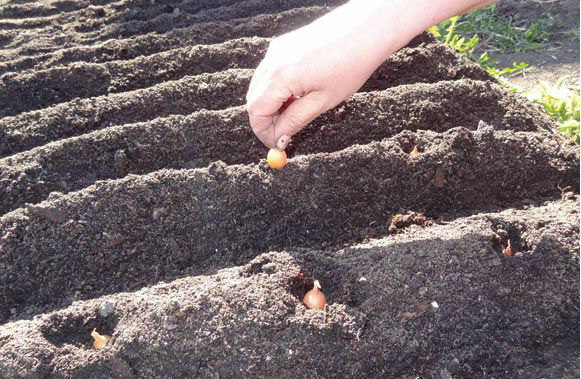 In early may, if you allow the Sunny days to begin planting bulbs in the ridges at a distance of 12 cm from each other. Sets to deepen into 2 – 3 cm, and the land around it, press firmly with your hands closer to the bulb. After 14 days the bow you need to fertilize with a solution of bird droppings. If the weather in the first month was hot, should be watered abundantly sets 2 – 3 times, and regularly to loosen and remove the weeds from the garden. In June it should be open the bulbs to shovel the earth from them, thus making a smooth aisle. The sun will heat and dry the bulbs completely, preventing the excretion of larvae of the onion fly. Open follicles grow rapidly in width, and acquire a flattened shape. In the middle of June you need to make a second foliar application, but at the root. You can use mineral or organic fertilizers. A month before the harvest bow, you need to spend tilling the soil. It is worth remembering that to stop watering the ridges with a bow you need three weeks before harvest. Harvest onions need in the first half of August, given the favorable days according to the lunar calendar. If not all the bulbs have time to grow, harvesting can be postponed until early September. It is important not to delay the harvest of onion and make it in time, so he began to germinate. If I can delay the cleaning, and onions have sprouted, you need to trim the root and the feather follicles, and the bottom to singe over the flame. This bow is fit to eat and will be stored for a long time, but for forcing you to use it is not worth it.